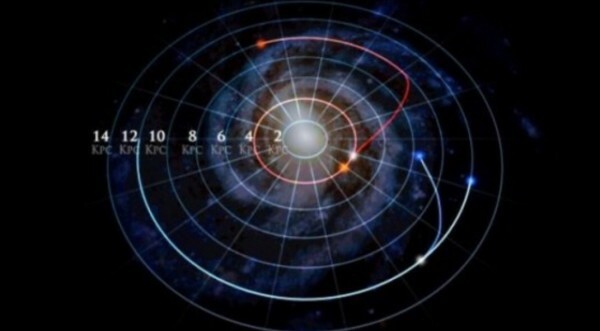 Stellar orbits within the Milky Way can change considerably over time, according to new research published in The Astrophysical Journal. The new work shows — via the use of map created via the Sloan Digital Sky Survey (SDSS) — that roughly a third of the stars in the Milky Way have dramatically changed their orbits. The new map that resulted in the new findings was the result of researchers utilizing the SDSS Apache Point Observatory Galactic Evolution Explorer (APOGEE) spectrograph to observe 100,000 stars over a 4-year period of time. Essentially, the researchers analyzed the elements in the atmospheres of the stars surveyed to learn more. “From the chemical composition of a star, we can learn its ancestry and life history,” noted Hayden. Hayden and his colleagues used APOGEE data to map the relative amounts of 15 separate elements, including carbon, silicon, and iron for stars all over the galaxy. What they found surprised them — up to 30% of stars had compositions indicating that they were formed in parts of the galaxy far from their current positions. With the SDSS work set to continue for several more years, the new findings will likely be fleshed out some in the near future.